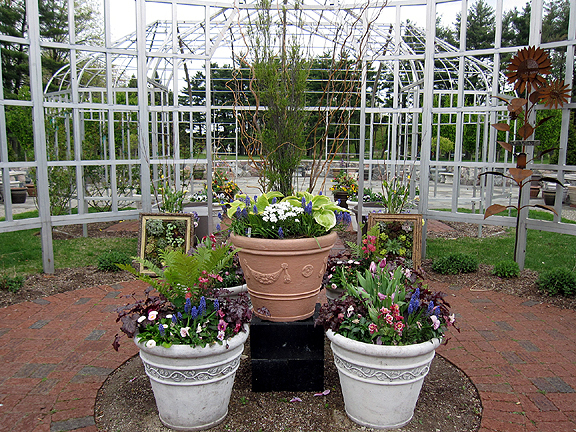 I love the container displays at Taylor Conservatory. They're creative and whimsical combinations of annuals, perennials, bulbs, or whatever is in season. Then I spied... Do you see them on the ground in the background?... 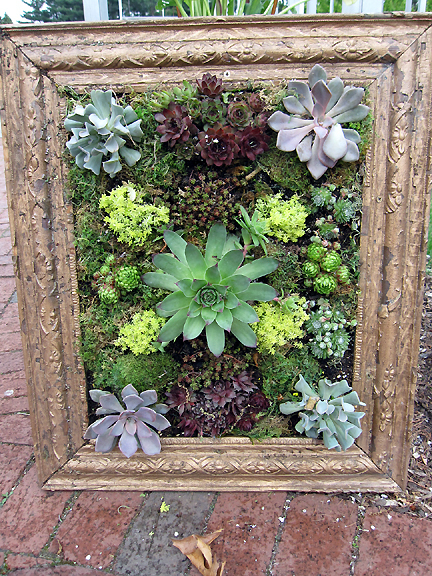 Two miniature living walls or vertical gardens, framed like art! I was giddy with excitement (so giddy I kind of blew the spoiler by showing you one right off!). Other vertical gardens I've seen have been equally gorgeous but quite large, usually encompassing an entire wall. These smaller gardens seemed less intimidating and actually possible to make oneself! 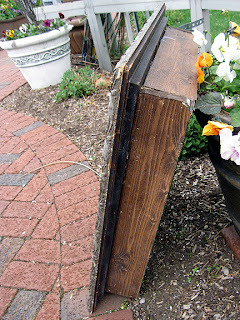 I've often seen old frames at yard sales, or you could buy and stain molding. (Or actually buy frames!) The backs the the frames are rectangular wood boxes, like a mini raised bed, made of four pieces of 1" x 4" wood (or thereabouts). I didn't measure the frames, but I'm guessing 2 ft. x 3 ft. You could make any size you want. The back of the box has chicken wire stapled in place, with a layer of moss laid on top before the soil was added. 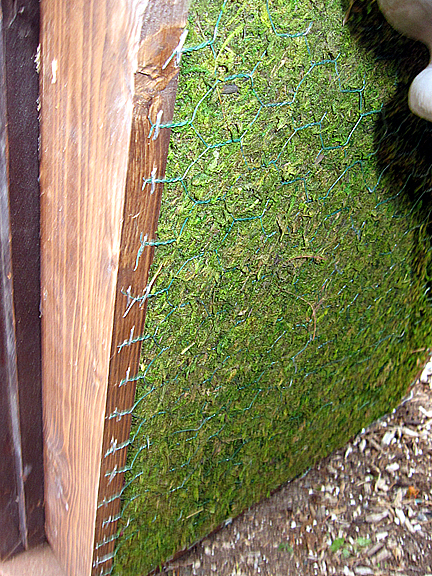 If you don't have moss, you could also use coco fiber, landscape fabric, or plywood with holes drilled in for drainage. Chatting with volunteers, I learned the box is filled with a well-draining soil mix, and topped with chicken wire. You can't see it in the finished product, but it holds the succulents and moss in place when the frame is set upright. 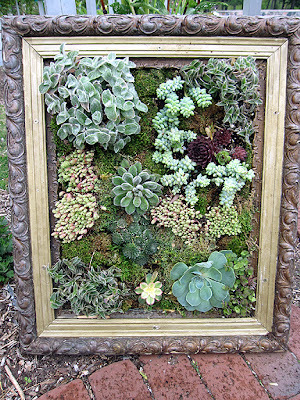 Not all of the succulents in these picture frames are hardy in Michigan, and they are kept indoors overnight this time of year. 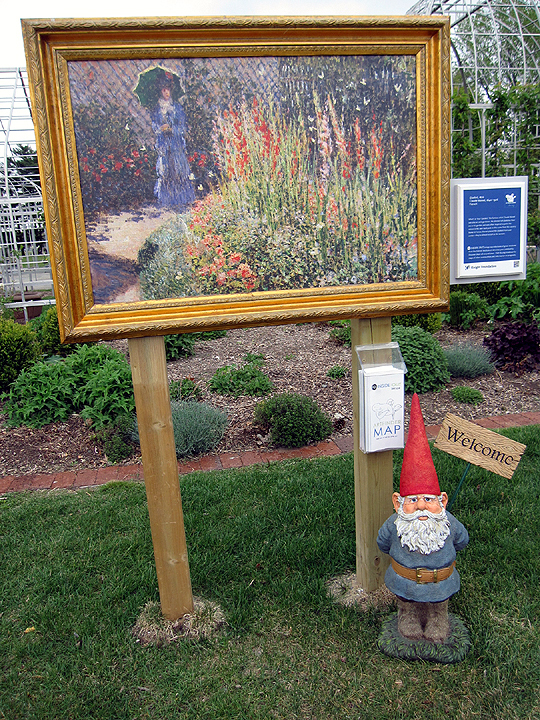 By the way, the framed succulents complement this reproduction of Monet's Gladioli on display through June 30 at Taylor Conservatory. It's one of many locations in metro Detroit showcasing weatherproof reproductions of art in the Detroit Institute of Arts collection, as part of the Inside|Out exhibit. Check it out! Those are gorgeous. I tried to plant succulents once, but they didn't survive. I'm not sure if it is the black walnut trees, or the zone I'm in (zone 4). I grew up in Ann Arbor, and I often wish I was gardening in zone 5 instead of zone 4! These are lots of fun. I "won" a small version of these. It grew well and did great while outside. I don't have a sunny window to keep it in during winter. ONly the succulents that don't mind less than full sun survived in good shape. I like the idea of putting a frame around the box. Mine doesn't have a picture frame on it. Just the box. I saw something similar to this on Lisa's blog one time, but it didn't have the picture frame--that adds just the right touch! 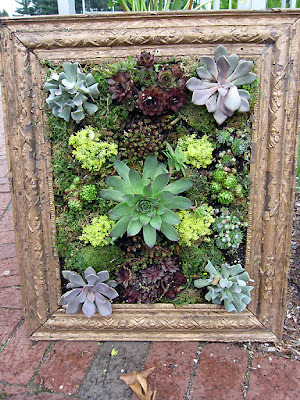 What a great way to recycle old frames, not to mention showing off small succulents like these. 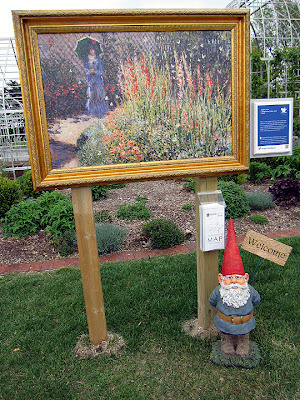 Ooh, I would love to have a Monet painting in my garden! I thought about emailing you to see how you are doing, Monica--I've missed you. Lisa, Beckie, and I are getting ready for a road trip to Asheville--wish you were going, too! Love those! I had fun with the succulents at G2B12, too, and all the flea-market containers we got to play with for planting. The picture frame idea is so cool. They use a hose with the nozzle set to mist. Thanks soo much for this post, I really want to try the succulent picture myself!